CTEK’s MUS 4.3 battery charger is perfect for those with high demands and can solve a broad range of battery-related problems. 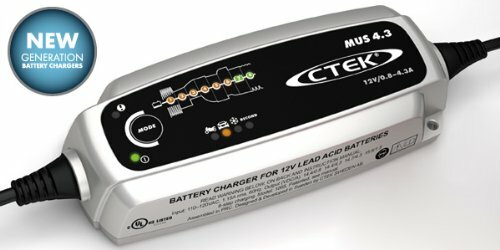 The MUS 4.3 offers state of the art technology that was previously only found in CTEK’s professional products and features 8 patented steps to maximize battery life and performance. A few of the key features are a patented desulphation process which removes sulfate from the lead plates, a battery diagnosis that shows if a battery can receive and retain a charge, a special reconditioning function that restores stratified and deeply discharged batteries, unique maintenance charging, a mode for optimized charging during cold winter days and the charging of demanding AGM batteries (i.e. Optima). The unique LED display allows the user to follow the entire charging process. The MUS 4.3 is a non-sparking, short-circuit proof, reverse polarity protected unit designed for untroubled usage and has built in overcharging protection. With the option al Comfort Indicator Eyelet and Pigtail you can outfit all of your battery needs for multiple batteries. The MUS 4.3 is splash, dust and water-resistant so that the solution can be taken to the problem even if it rains or snows. Included with the MUS 4.3 is the charging unit, a Comfort Connect clamp, a Comfort Connect M6 eyelet and a storage bag. For complete operating instructions please read the enclosed manual in the box. All CTEK products are delivered with a 5 year limited warranty from the original purchase date. The limited warranty is not transferable and only covers manufacturing faults or material defects. Warranty is only honored if product and original receipt are returned together to the retailer. Warranty is void if the battery charger has been opened, handled carelessly or repaired by anyone other than a CTEK Power Inc. or its authorized representatives. 9 of 10 people found the following review helpful. Another powerful tool for recovering abused batteries. Not a panacea though. I have an old Schumacher battery maintainer, a Yuasa SmartStart 1.5, a Pulsetech Xtreme, and the CTEK MUS 4.3. The Schumacher is just a maintainer/charger. It has no desulphate mode, but works well to keep the battery topped up. The Yuasa does the same thing, but adds a mediocre desulphate mode. In tsting, I showed that it did bring batteries to a higher state of charge then the Schumacher. The Xtreme Charge is a powerful tool for desulphating batteries, but it does not do as well as the MUS 4.3 at fully charging a good battery. The MUS 4.3 has a desulphate mode, but I've never seen it enter that mode, even on a badly abused battery. I'm currently in the process of attempting to restore a 12V 22 Anp-hour 5 year old AGM battery that was deeply discharged, to under 6v. The Schumacher, Yuasa, and Xtreme all refused to even start on this battery. I had given up on it, and was about to order a replacement, when I decid ed to try out the MUS 4.3. When I plugged in the MUS 4.3, it attempted to charge the battery, but then found the battery bad after it dropped to under 12v in 3 minutes, after it attempted to charge the battery. I feel that afew attempts to recharge the battery would probably have done the trick, but it was bed-time, so I figured I'd go back to ol-reliable Xtreme Charge. I then hooked up the Xtreme Charge, and it began to charge the battery. After letting it sit overnight on the battery, the battery was able to hold over 12V. I decided to leave it on the Xtreme charge another 12 hours, and will attempt a recondition with the CTEK. I will update later on my progress, but my conclusion so far, is that the CTEK offers features the Xtreme Charge does not have, while the Xtreme Charge offers features the CTEK does not have. Both are top of class chargers. I wish I could somehow combine them into one. If the CTEK would always desulphate, like the Xtreme charge does, I'd pick it over the Xtreme. As is, I'd lean more toward the Xtreme. For cases where it does not want to start charging to to low voltage, one can use a $10 trickle charger to bring the battery up over 11 volts. My trickle charger died though, and I have yet to replace it. After leaving the battery that the CTEK said was bad, on the XTreme charge for a week, it now is working well. The Xtreme Charge would not charge the battery before I tried the CTEK on it though. At this point, if I had to have one battery maintainer, I'd stick with an Xtreme Charge and get a $10 trickle charger for truly dead batteries, to get them up to where the Xtreme Charge will charge them. That said, I'm happy to have the CTEK, in addition to the Xtreme Charge as the different modes the CTEK has can come in handy. I have a car with a year old battery that stopped accepting a charge. This car sits a l ot, but is kept on one of my battery maintainers when it is sitting for long periods. After several months of driving it every day, it stopped accepting a full charge. It got to the point where I was keeping it on the Xtreme charge at night, but it still would barely start the car at the end of the day. I checked the alternator and it was fine. I was almost ready to buy a new battery when I decided to give the CTEK a try. I set the CTEK to recondition mode, and it spent several hours charging the battery. The next morning, the engine fired up with gusto. That evening, after sitting at work all day, it fired up with gusto again, and the next morning and evening as well. The CTEK just paid for itself once more. At this point, I feel like both chargers, the CTEK, and the Xtreme, definitely have there own niches. I am glad I have both. 9 of 11 people found the following review helpful. I have two CTEK 3300s and love them. A CTEK representative encouraged me to get the 4.3 and I regret my decision. Not only is it at least $25 more than the 3300, the cables are shorter and there is no OFF button. That means 1) it won't work in all my cars because the distance between the positive battery clamp and the chassis ground is too far for the shorter cables and 2) you get that nice SPARK when plugging it in. The 3300 has both a longer cable for the positive/negative clamps and an off button. I personally HATE sparks anytime I'm dealing with a battery. Of note, the 4.3 does have a battery recondition mode which I suppose is nice if you have completely depleted a battery as well as a better indicator of what it is doing. Still, I wish I would have just bought another 3300. UPDATE 01/04/2013: I still don't like the fact that there is a small spark when you plug this in, HOWEVER. I have now reconditioned two batteries AND the price is similar now to the 3300. So given the choice, I would live with the small spark and shorter cables in order to have the recondition mode. My BMW battery was giving a discharge warning recently (a known issue on new BMWs) and I gave it a recondition over the weekend and have not seen the error since. o The CTEK 56-864 MUS 4.3 Charger with 6' AC & 12V leads permanently attached. o Clip leads similar to the CTEK 56-384 Comfort Indicator Clamp, but with no indicator. They're 16.75" long and the clips open to a maximum of 1". o A manual in English, French and Spanish. o A lightweight fabric bag with a how-to graphic on it. Shipping: My unit was shipped in a retail display cardboard box. +1 for not so much packaging in cardboard, -1 for potential damage to the unit during shipment through the plastic display window in the box. o Attach to battery, plug in, select mode, wait. o Unit restarts in same mode as when last plugged in. Startup delay is a couple seconds. o Unit restarts charge cycle when modes changed or battery is dis-, then reconnected. Initial reaction: Nice! The unit brought our 6 and 8-year old flooded-cell auto batteries from 12.36V to a full charge of 12.6+V, stepping through the charging stages (@ 14.35V during the absorption stage) to float @ 13.55V. Voltages were measured on the battery terminals with a Fluke 115 DMM. o The indicators are hard to see in sunlight. o A rubber case or end bumpers would be nice, both protecting the unit and keeping it from slipping around as much during use.